We are looking for one or more of the following Browning machine gun parts and accessories. Browning M2 water-cooled machine gun mount. M3 Water Chest. Any condition. Mark 17 AA Sight, w/Bracket. Naval Deck Mount AA Sight, Mark 17. AA Sight and Bracket. Any condition. Browning M2 water-cooled machine gun sight. Tora-Tora AA sight. Any condition. Browning M2 water-cooled 45 inch barrel. Water Cooled Barrel. Any condition. 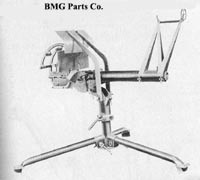 BMG Parts Co. buys only 'original' Browning machine gun accessories. 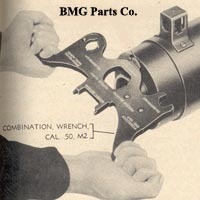 Please See the BMGParts.com Terms & Conditions page for further details. Original US GI accessories for Browning Machine Guns and Semi-Autos. Copyright 1999 - 2018 BMG Parts Co., Inc.